My summer meal plan for next week! I used to be SO efficient with meal planning, especially before I had Edie. Each week I’d print out a meal planner and pin it up in the kitchen so that I could see exactly what I had planned to cook… then I slowly stopped doing that. Meal planning properly can really help to cut back the weekly spend and food wastage so I am trying really hard to get back to it. I don’t think it’s especially tough during summer so I thought I’d share with you our meal plan for the next week. Monday – Shredded chicken fajitas – 2 chicken breasts slow cooked in mexican spices and shredded. Sunday – Dare I attempt a Sunday Dinner? I haven’t had one for ages so I think the answer is yes!! Our’s usually has roasted chicken (or sometimes beef), mashed potatoes, mashed carrot and swede, broccoli, cauliflower, peas, yorkshire puddings (hello, we’re in yorkshire – plain rude not to) and red cabbage. So working out my meal cost for the week (I do the bulk of my shopping at Aldi and then grab extras/luxuries from Asda) I will spend roughly £32.50 on meals (including using things like the ham for flan for sandwiches/lunch boxes and adding in breakfast cereal etc), £30-35 on luxuries/snacks (chocolate/crisps/wine..) and £25 on a takeout. That makes our (max) spend for the week £90 for a family of 6 for food… how does that compare to you, do you think that’s reasonable? What is on your meal planner next week or do you wing it? P.s – I’m not including the cleaning or laundry products in this and we are by no means thrifty on those or food, but I do think that by planning we can save quite a bit. Stonehouse Pizza Parties because, um, Pizza. We waste a lot too when I don’t make a plan! I dont meal plan myself but i understand the benefits. Whenever i see others plans I always want to start trying it myself! Never heard of Tomousska before so am checking your recipe out! It’s great you have such a varied meal plan each week. I’m a fail of a cook so it’s just pasta pasta pasta for me at the moment! Thanks Lisa – we don’t do it all the time but this is a prime example of how much planning can really help! I’m not a huge fan of Aubergines so I’m loving the sound of the Tomousska! Super tasty, give it a go! Great meals and sure the family will love it. I’ll go for the Shredded chicken fajitas; sounds very yummy. This sounds like a good meal plan. I need to try making a flan this year. They’re not so common here! I really enjoy meal planning. I usually start on Fridays and plan for meals for the week ahead. I don’t put days against the recipes as usually like to choose what I want to cook from the menu the day before. Sunday roast is a must on Sunday’s :-). Chicken is my favourite. I wish I was that organised… I used to be! I wing it but when I move hopefully I will be spending less money on food because it is not a good habit of mine. We love all of them! Hands up I don’t meal plan it is probably something I should do, but I never seem to remember to actually do it. Good luck with sticking to your budget. I really need to start meal planning, I usually just wing it. I usually decide what to have for dinner at about 7pm! I wing it most weeks but I really should start planning meals. Need to look into that. Give it a go – I don’t do it all the time but it is useful when I do! It looks like you have some delicious meals planned. Fajitas are always a favourite in our house! They are so good aren’t they?! I love reading meal plans and getting some inspiration from them. The summer flan sounds awesome. Thanks lovely – they are perfect for inspo! 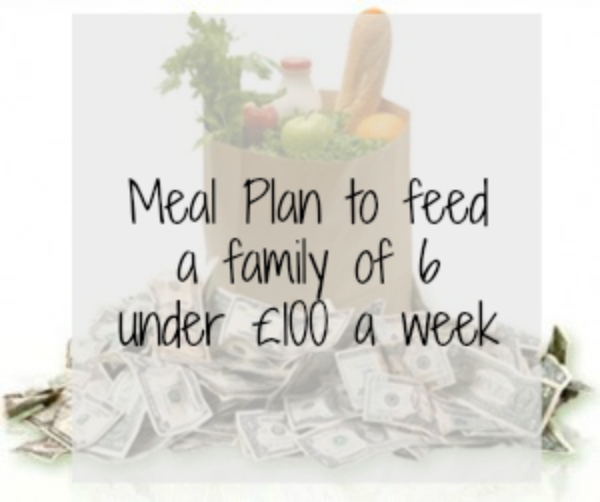 I don’t meal plan but it’s something I really need to do now as we’ve just lost our working tax credits, argggg. Oh no!! Start planning lovely! Thanks Rhian! It works well! That is excellent budgeting, making meal plans really help to stop those impulse buys. Your meals sounds lovely, I can not meal plan to save my life. I have no idea how much I spend a week, as I tend to buy extra some weeks and some meals I freeze half down for another day, so some weeks I just buy the basics. Haha don’t work it out! I do usually wing it… or spend time planning then deviate! A great plan. I really need to get back into planning meals for the week. I am hugely keen on a meal plan, and I plan according to what I need for commissions, We tend to have our main meal at lunchtime too, as that is when it is light. I do shop from Ocado as they are the best supermarket at not giving an substitutions, and we spend about £50 a week for food, toiletries and cleaning products. So I think your £100 is spot on. I have no idea what I spend weekly on food but might try and work it out and see if i can cut it down a little. Haha it’s scary when you first work it out! I am lazy too often haha!